The "background" behind the curvy "cross" appears to be a vision of hell. Rainaldi's portrayal of JPII would fit well in a Dante inspired vision as well. Come to think of it the Tiara and Keys poster could as well. Visions of hell in what should be clearly inappropriate and theoretically "unintentional" elements of various works of "art" seems to be a reoccurring theme in modern "Catholic" "art." There also seems to be a pattern that the "artist" doesn't seem to see it. Modern "Roman Catholic" "art" -- Lord have mercy on us -- either "unintended," entirely inappropriate visions of hell or hippy degradation of Eastern iconography. "Papacy? What Papacy? A Fading Memory"
"Total Chaos - 50 years!" [Thanks go to Fr Paul Marx OSB (RIP)]. As Radaelli says, if this is not rupture, what is it? What a load of rubbish art. Should be consign to scrap heap. picture tells a thousand words: for Verita and Carita no Chiarita is necessary. And notice that there is no Bonta there either. Most art today, including ecclesiastical symbolises lost hope and moral amnesia. At the foot of our bed we have a reproduction of e Annunziation by Beato Angelico (purchased at the Prado museum in Madrid). It is the first thing I see every morning, and it pretty much summarizes our faith. Bring the primitives or baroque artists back, please. I sometimes have to attend a NO mass with tambourine music so I am not a purist, but a real religious painter could make a fortune. All this hellish images and sculptures that are display at the Vatican and in many Catholic Churches around the world is because the Popes of the pasts few decades with bishops, and priests have allow the devil in God's house as Father Malachi Martin said. The beauty that elevates one's soul into the heavens is gone. I'd rather have Ravasi in Milan than Bruno Forte in Venice! I'd rather have both spend the rest of their lives in Mount Athos. At first they should demolish this monstrosity of the "Aula Paolo VI". There is no other building which symbolizes more the modernist nightmare. "I'd rather have both spend the rest of their lives in Mount Athos. "At first they should demolish this monstrosity of the "Aula Paolo VI". There is no other building which symbolizes more the modernist nightmare." Do you mean that most dreadfully ugly sculpture? I hate it when artists deform the humanity of Our Lord like that - it is not true, good nor beautiful. 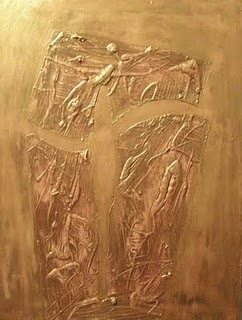 Real art even when depicting the horrors of the Cruxifixion of Our Blessed Lord, does not deform His sacred humanity. My dear brothers and sisters not too long ago I myself was thinking about that hideous evil looking sculpture in the so called Paul VI Hall at the Vatican. All this evil art and artists the Vatican has allow in it, should be destroy and burn. How can they relish at such evil looking art seemingly depicting holy images when it is obvious at least to some of us that beauty inspired by Our Lord is NOT THERE ??? I can only conclude that the evil one has inspired the members of the curia who allow it and the so called artists that produced such garbage. Lord Jesus we await your second coming so you can set everything right again. The JP frigo monument is symbolic of the one who did not have the stomach for disciplining his recalcitrant bishops and presbyters.